This class is now full. Add your name to the waitlist below. We'll let you know if a spot opens up. If it doesn't, you'll be added to the "Super Secret Early Registration Email" list to get early registration opportunities next time Zen 1 is offered. Thanks for your patience! Would you like to play and laugh in a supportive community every week? Could you use some practice in mindfulness? turning off your judgmental mind? being brave? Curious about how this whole improv comedy thing works? If you answered yes to any or all of these questions, Zen of Improv 1 would be an ever so lovely way to spend some time every week. 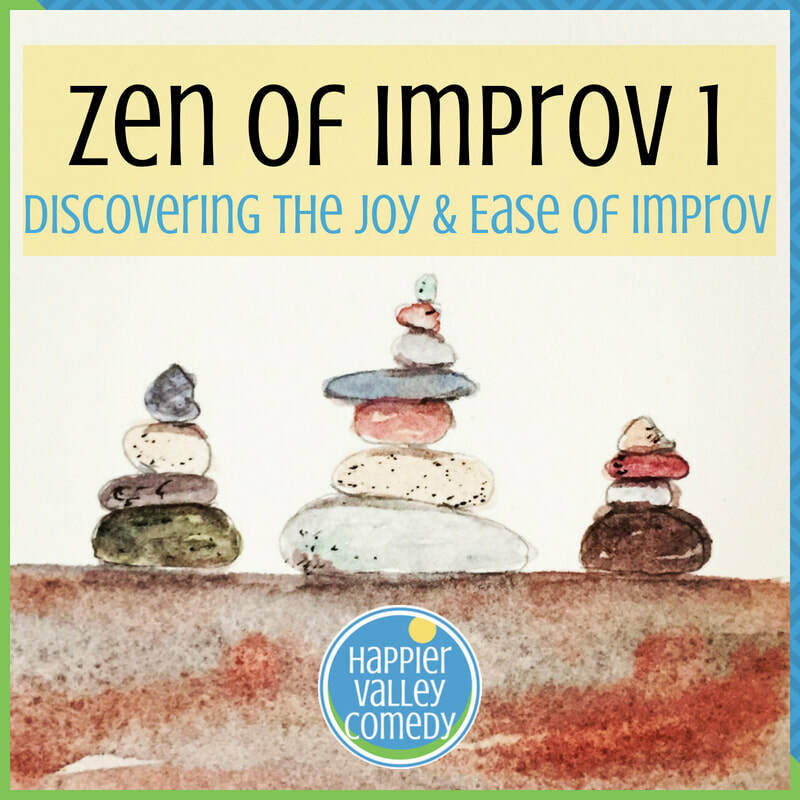 Happier Valley Comedy's Founder and Head of Happiness Pam Victor offers this weekly for adults who want to try something fun, rewarding, and, quite possibly, mind-expanding. You'll learn a very gentle, very easy, patient approach to improv comedy in an incredibly positive and accepting atmosphere that will get you up on your feet and out of your head. Through improv exercises, games, and scenework, you'll practice the vital improvisation skills of paying attention acutely, accepting other peoples ideas, redefining and disempowering failure, staying in the moment, quieting your critical voice to invite more joy and ease into your work, and much more. No experience necessary. Being funny is not required! Want to stretch your wings for a couple hours every week and laugh yourself silly in in the process? Sign up and let's play! About Your Teacher: Pam Victor is an improv comedian, author, teacher, consultant, and nice person. She is the founder and Head of Happiness of Happier Valley Comedy, the heart of improv in Western Mass, where Pam teaches improv to the best students in the world as well as bringing the power of improvisation to the workplace in the THROUGH LAUGHTER program. TJ Jagodowski, David Pasquesi, and Pam are the co-authors of "Improvisation at the Speed of Life: The TJ and Dave Book." Pam is a nice person and likes you already. "Improv is truly changing my life for the better. I am immensely grateful for all you do."